In 2012, Elvis Presley’s Bible was sold at an auction for $94,000. Presley received the Bible from his aunt and uncle on his first Christmas at Graceland in 1957 and used it until his death in 1977. Presley’s upbringing in church has also been well documented, but that influence rarely manifested in his original music. One exception was in the tongue-in-cheek song “Hard Headed Woman” (by songwriter Claude Demetrius), which shot to #1 on the radio charts in 1958. 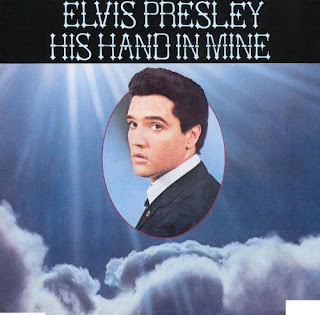 In the 12-bar blues flavored tune, Presley opines that mankind’s troubles can be traced back to what he believes are strong-willed and stubborn women and provides examples from the Hebrew Bible such as Eve (Genesis 2:7–3:6), Delilah (Judges 16:4-21), and Jezebel (1 Kings 16:29-33). Most of Presley’s biblically inspired lyrics, however, are found in his popular gospel albums, which tallied over five million record sales. His Hand In Mine (1960) included an adaptation of the African-American spiritual “Joshua Fit the Battle of Jericho,” taken from Joshua 6:15-21 while the title track from How Great Thou Art (1967) invoked an array of Bible references (Psalm 8:3, Psalm 145:3, Romans 8:32, 1 Thessalonians 4:16, John 1:29, etc.). Presley released his third and final gospel album in 1972. The title track, “He Touched Me” (by songwriter Bill Gaither) had already been made popular by Doug Oldham, The Imperials, The Blackwood Brothers, the Cathedral Quartet, and J.D. Sumner and the Stamps Quarter, but Presley’s rendition brought the song to an international audience. It also garnered him the 1972 Grammy Award for Best Inspirational Performance. Dear Lord, we thank You for the talents that You give to each of us. Help us to use them for You today. In the Name of Jesus, Amen. Want It. Will It. Work It.